We have lots of new, awesome beers on tap here at Altitude including some special guest taps (which won’t last long). We’d love to pour you one, so come by and see us. Additionally, we still have some seats remaining for a very special event going down here Saturday, April 16th. We are partnering with the amazing Ballast Point Brewery (San Diego, CA) to offer a special night of beer pairings and food inspired by the unique flavors of Asia. 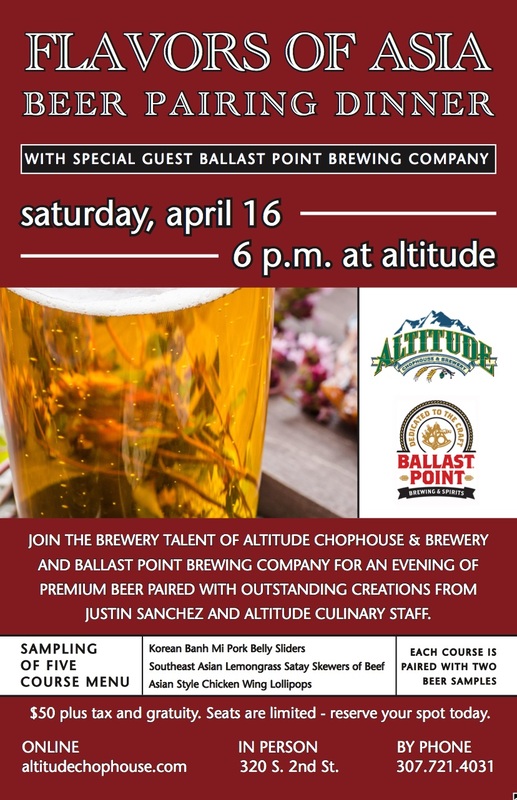 Having seen the lineup of beers and working with Chef Justin Sanchez to develop the menu, I can assure you that this event will be one to be remembered. You can reserve your seats by coming down to Altitude (or via our website). It’s truly an honor to partner with a brewery of this caliber; you don’t want to miss this.